A friend of mine has recently purchased a new apartment and I am going to be helping her with some styling ideas. In true “modern couple” style they are giving up the large master bedroom to create an entertainment den, getting rid of the laundry to create a bar and sacrificing a second living area for a large dinner table for hosting dinner parties. It is amazing how we we look at spaces now not as what the floor plan dictates but rather how the floor plan will meet our lives. 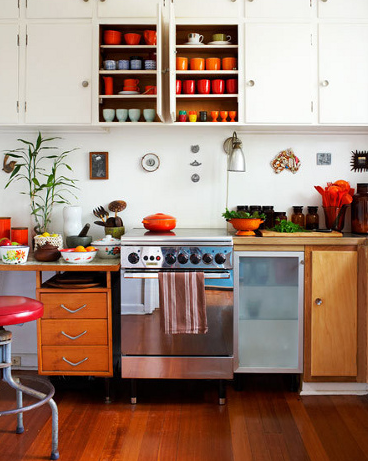 If you are currently living out your space in it’s traditional way I would encourage to think about your options. Do you really need a second bedroom or would a dedicated home library meet your lifestyle? 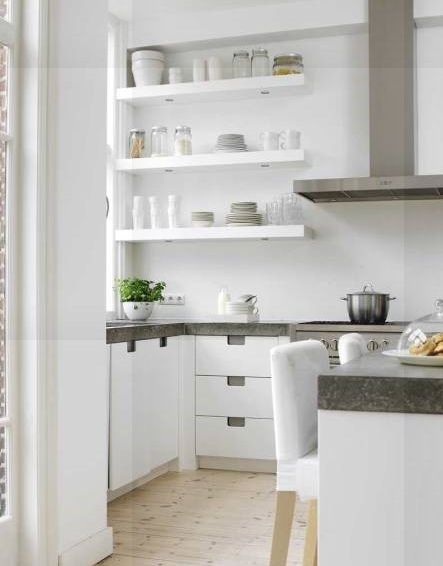 Do you need that cupboard for storage or could it be transformed into an office behind doors? One way to create a whole new ‘activity area’ in an empty space is create a window seat. 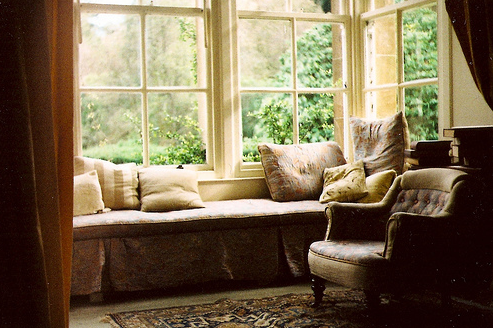 Often a window is dead space- it is used as a window to create light and left to it, but with this idea you can create a new living corner, a reading hub, a quiet space or a retreat. Now, this is not a revolutionary styling idea but here are some assumptions dispelled (there is a bit here because I think everyone should be inspired to give this a go). 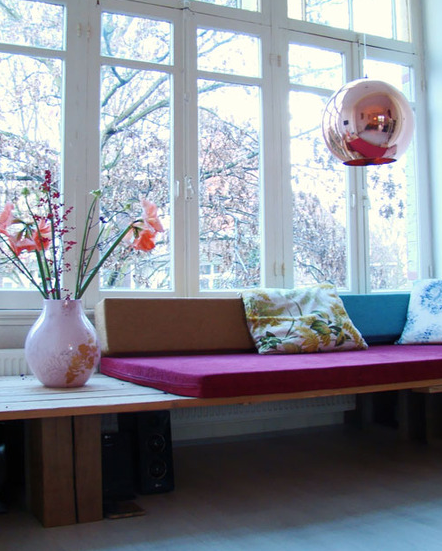 You don’t need a large space- as long as it is wide enough to sit comfortably you have a possible window seat. 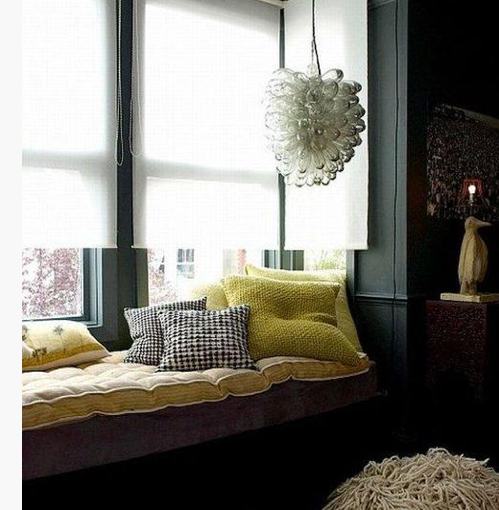 You don’t need this to be a built in structure- place a settee in front of a window- voila- window seat! 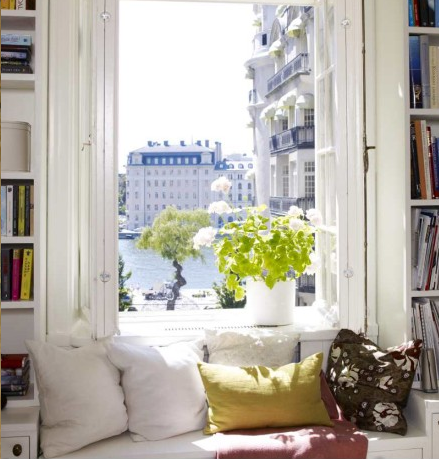 Add some depth around it with bookcases, side tables, stacks of cushions or floor lamps- you don’t need to build a bay window and permanent seat. You don’t need this to be pretty and floral- rustic leather lounges, over sized black cushions, masculine wooden details, decked by a mini bar and your in business. 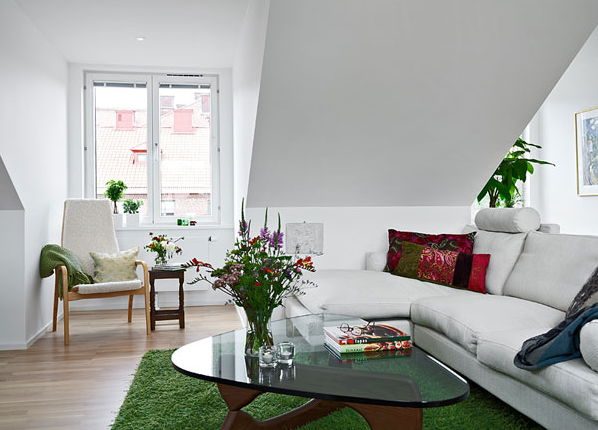 This can work in a clean modern space- the second last image is a good example of a minimal window seat. You don’t need a small room – large open plan spaces can be redefined by developing a second seating area in front of the window in addition to the main couches in the space. A window – most of us have one. Cushions- you want to seat here, you want it to be comfortable. Good lighting- have you got some way of managing the say light and softly lighting at night. Some reading material- even if you don’t use it- it looks good. Mirrors are always a friend when styling- they reflect light, look amazing, can be all sorts of styles depending on the frame and they functional at the same time. I have recently spent hours trying to get a mirror to my mum for your birthday (sorry mum if you are reading this) only to find out that it is hard work transporting the large variety of these from Sydney to Wagga- that means you are not getting a mirror this weekend mum- oops. 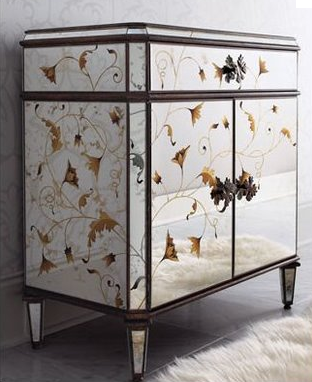 If I could have, I would have found you some yummy mirrored cabinets- like these. 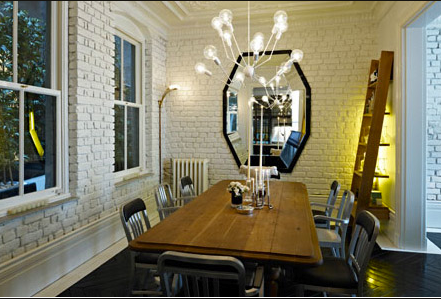 All sorts, all styles, all space- make everything look brighter, cooler, and more interesting with a mirrored surface. Think about what is going to reflect- patterned carpets are a good one. 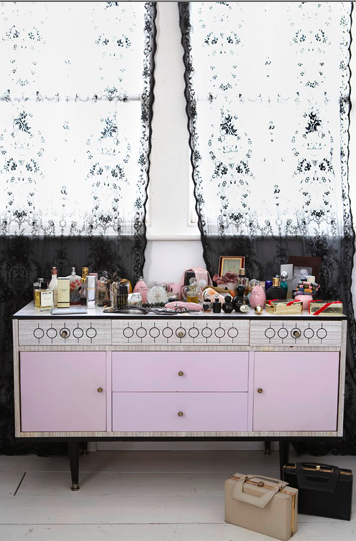 I love how these are broken up with patterns, panels and prints- not stock standard formal mirrored cabinets. If you want to make an impression turn one these into a drinks cabinet. 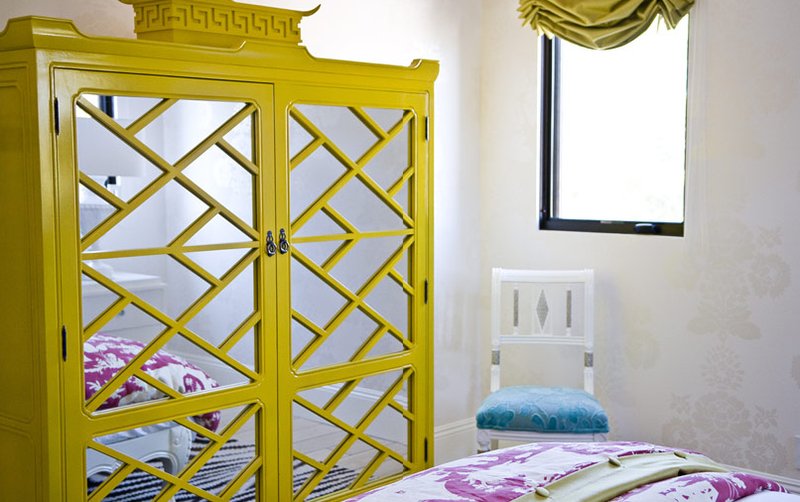 Don’t stick these to the bedroom- think about hallways, living, dining and entertaining areas. DO keep them sparkling and clean. ohhh the sunshine, the sunshine! For those of us in Sydney this morning is truly glorious! The sun is shining through my window and making the day seem so exciting already, funny the power of light. I spent the wee hours last night reading about feng shui for a client and that started me thinking more about bright colours. 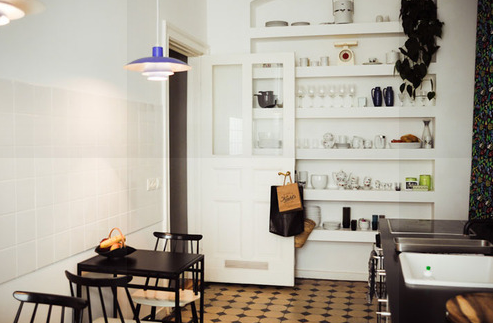 There seems to be a strong trend around white interiors, however the next step of that trend is creating bright accents around the room- check it out. This is all about accessories! Think about everything and imagine in a popping colour. 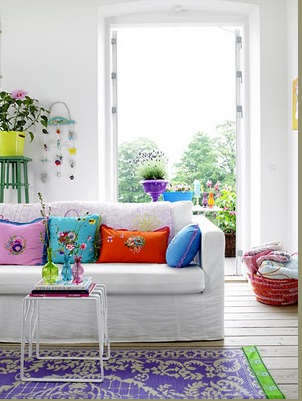 Start with the obvious- rugs, cushions, lamps, flowers, indoor plants, throws, artwork and side tables. 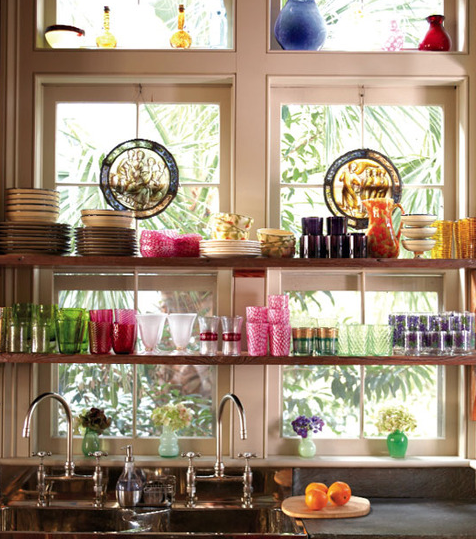 To create your second layer of colour think about smaller items in bright palettes that will bounce against the white and add an extra dimension- teapots, vases, pot plants pots, glasses, cookie jars or tea towels- anything you can add a bright colour to will work. DON’T panic about picking the right colours- this is inspired by nature at it’s best- yellow, lilac, grass green, sky blue, pinks, raspberries, orange, lime, aqua, teal or citrus – so perfectly spring. HERE’S the main tip- don’t get stuck with primary colours- add something outside the primary colour range to make sure it doesn’t look like a school classroom. In the above examples the a 1st image uses lime, aqua and pink, the 2nd uses powder blue, the bathroom image uses a neon green- anything outside the primary family will throw the eye off and let all the colours exist together. 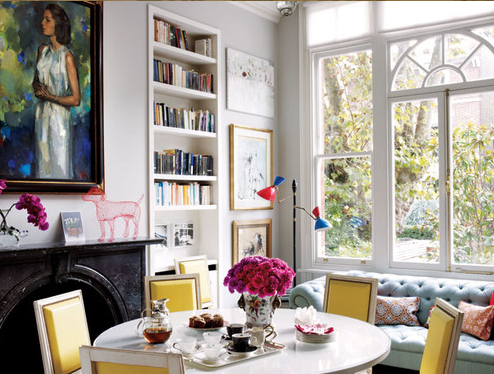 I have included the Elle Decor reference as an example of adding brights to a more classic space- the flowers, the lamp, the chairs, the puppy dog on the mantle- these are all unexpected in this classic setting but they make it so much more interesting don’t you think! Have a sunny and colourful day. 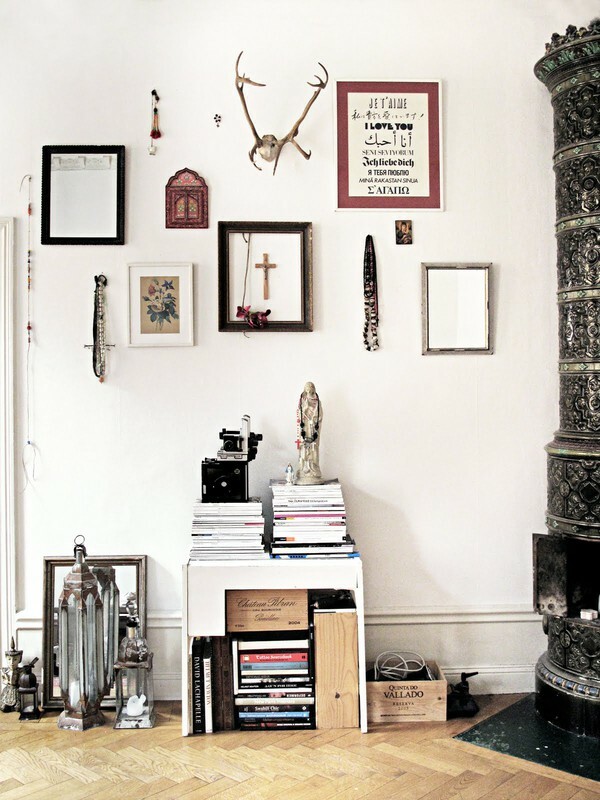 When you personalise a space it is amazing how many things you have held onto for different reasons. Photos, trinkets, jewellery, tickets, cuttings from magazines- lots of little “I will keep that for later”. I am about to do a vision board in my room- something that I have wanted for a long time. This board will host images of what I hope to achieve, what is important to me and things that inspire. Rather than do a cork board “mum in the kitchen” style I might hunt down some old frames and get creative with something like this. I love how these frames allow un related and different shape and size images be grouped together. Think about your layout before committing to the wall- lay them out on a piece of butchers paper and when you are happy trace your pattern- that way you can stick the butchers paper up and make whole where you want the nails or hooks to be. 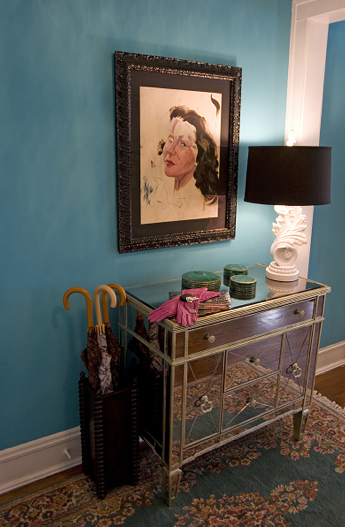 Take inspiration from the second picture and place your objects inside the frame at different alignments. 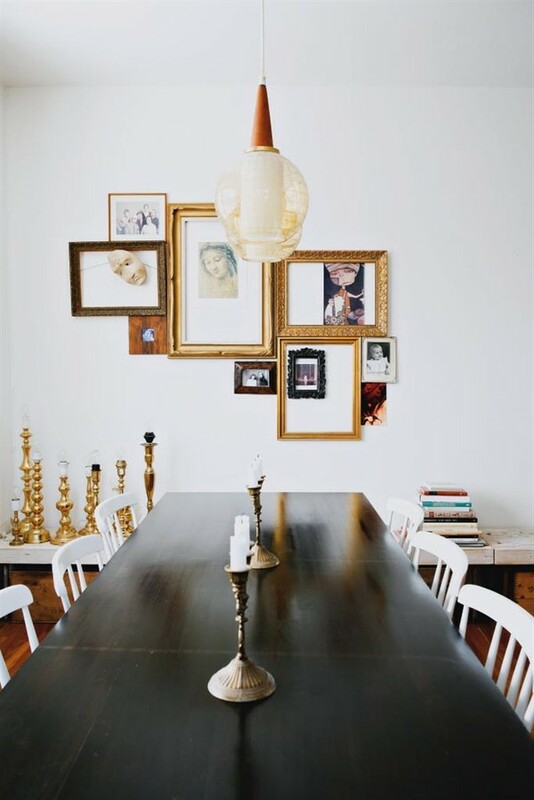 DO use frames inside of frames for a quirky effect. DO look for objects that are a different shapes to create a break in the angles. DO remember that colour rules apply- the colours of images are important too in creating harmony! If you are not confident working with negative space keep the frames connected to each other like the second image. DON’T use just photos in this- gather a variety of pieces that are personal but most importantly beautiful. DON’T forget about the space below- you want to create a casual but not cluttered area around this wall so keep you styling eyes on until you have completed the wall. Ok, not only am I late today I am not posting on the launch from last night (just yet). I was on sale table duty for a huge part of the night and beer drinking duty for the rest so I unfortunately didn’t get to grab all the photos I wanted of the night. Today is the kids launch so I will snap some more and pull together the images for tomorrow- sorry. Apart from the gorgeous chair, table and linen the colours in the room are amazing- ice ice blue with mustard offset with grey and teak- does it get any better? 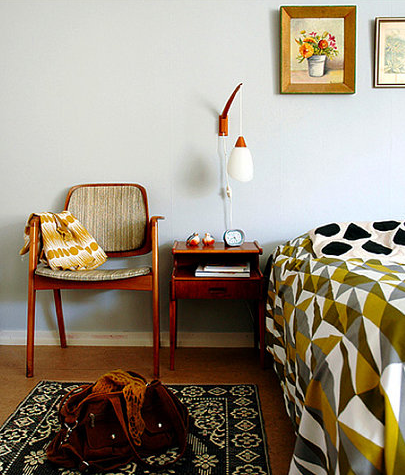 DON’T be afraid to mix prints – this rug and bedspread at diametrically opposed and yet work wonderfully. Look for murky dirty mustard’s not American mustard yellow. Keep your blue icy and cold with a grey base not baby blue. PS On the day I was planning to post on a cardboard city the incredible Dana at Yellowtrace Blog has done a post on the coolest cardboard camera’s you have ever seen- you should check it out for sure! I’m in Melbourne at the moment and I spent all day yesterday setting up the most amazing cardboard city EVER! My clever little sis has written a kids book and the launch is tonight! I will certainly be posting about the outcome…..so look out for tomorrow’s post. The venue that the gallery is attached to is the trendy little spot owned by Jerome (of Laneway Festival fame) called 1000 Pound Bend – this wonderful Melbourne venue, of course, uses a plethora of velvet lounges to create the retro laid back feeling. Like my “Mixing Lounges” idea earlier this styling idea is easy to do – however this time stick to velvet and one colour blocks. 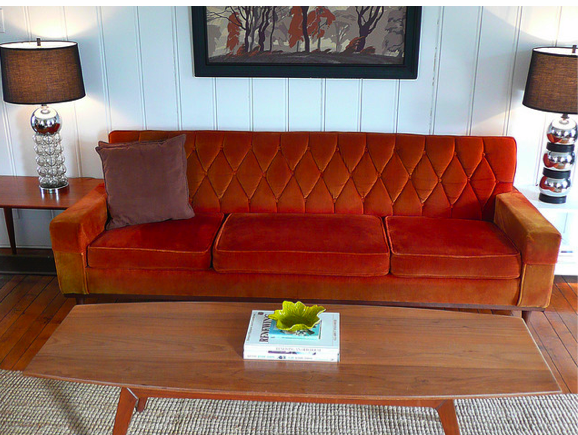 Look for colours in traditional retro palette- ruby red, burnt orange, turquoise, ice blue, mustard, moss green. Look for pieces that are in good condition- cafe’s can do torn furniture but to use these everyday you want it in good nick. Look for different shapes – shape lines, Queen Anne, modular- anything goes. 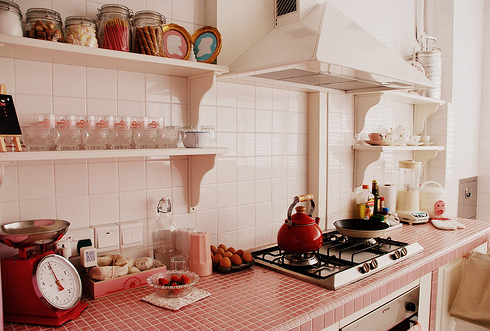 I love a styling idea that straddles different styles- make this feminine or retro at your peril. 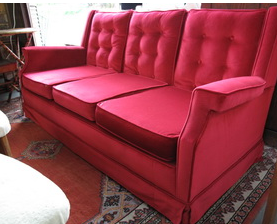 Use a velvet piece in a bedroom, a formal living, an outdoor room (under cover) – where ever! 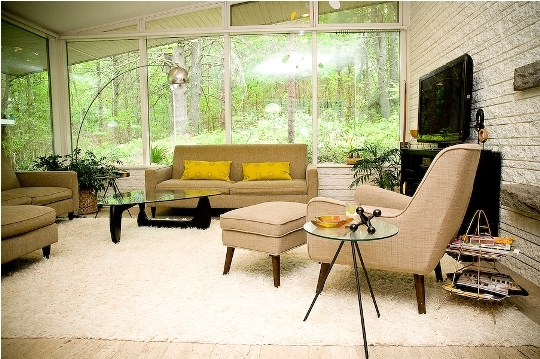 Do use rugs to pull bold together in a seating area. 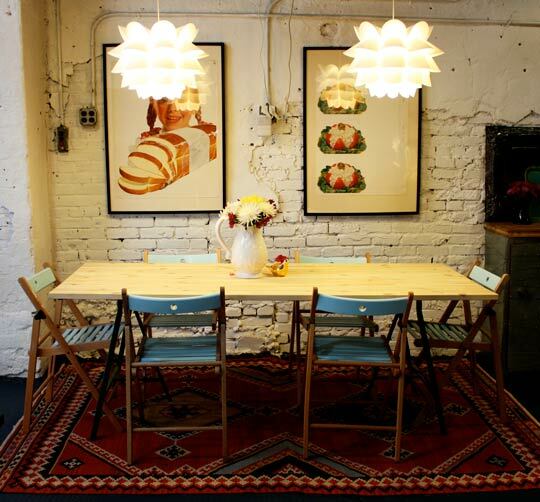 Do you lamps- lots and lots of them in vintage fabric shades and tassels and ceramic bases. Don’t use modern cushions on these couches- bold contemporary prints would look out of place- think crochet, retro florals, fringed cushions in nanna fabrics only. I’m bringing back lace curtains. If you were to see my list of things to bring back you would be horrified at my ambition yet hopefully optimistic that the contents is all worthy of a revival. Some of the best inspirations from fashion are in fact pure rehash and interiors are no different- we just need to remember that they never repeat they just rhyme. 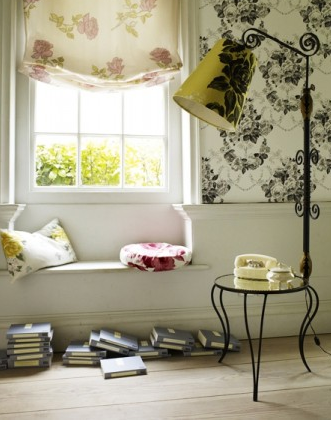 Think of lace curtains as the new double denim- you can’t believe you are doing it again but it is so good. DO think about how you are going to drape this – it is best if you do not need to tie them back- let them hang casually. DO look for the lace in different places- table cloths for example often have a nice see through pattern that when draped can look amazing. DO think of other colours- yellow, pink or green would work well. 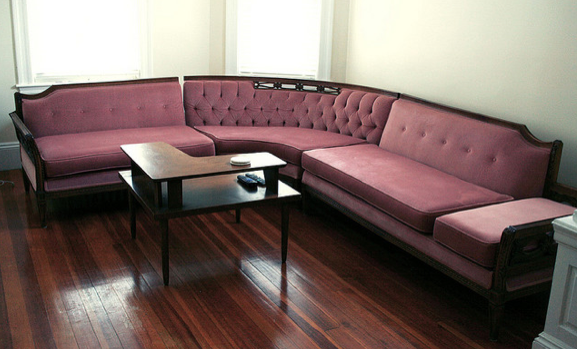 DO look for furniture that highlights the retro inspiration. Everyone has a shower right? And there are certain things that need to achieved while we are in there? And yet we are always balancing the containers and implements and the limbs precociously while the water gets in the way. And we like the water because it is keeping us warm, but it is getting in the way. Why don’t you just sit down and position everything nicely. This gorgeous example is inspired by the Butterfly chair originally designed by Sori Yanagi in 1954 and is actually a design that is in the MoMA’s permanent collection. Look it up- you should know this. DO pick something in a colour!! 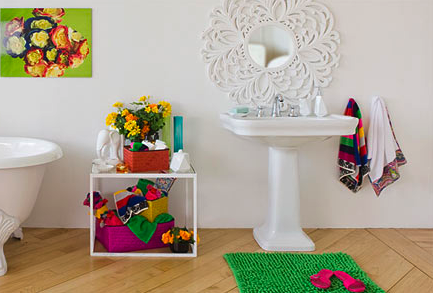 What a way to add colour to your bathroom don’t forget your towels. DO pick something that is waterproof- plastic is a good place to start. 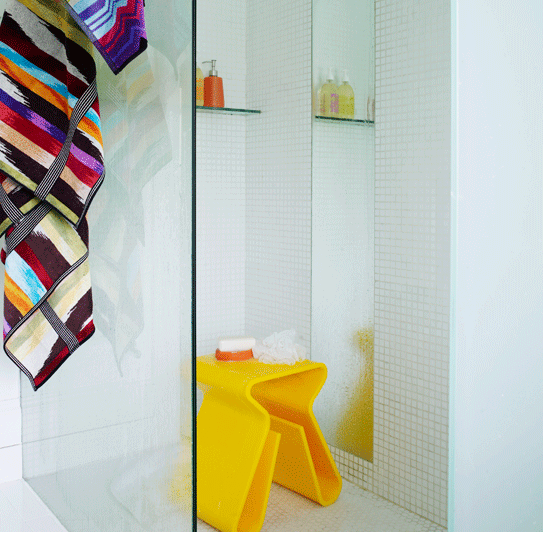 DON’T worry if it is not in the “shower seat” aisle of your local homeware store- be inventive and find something that looks good that you can sit on that won’t rot or melt in the shower. Done.